After 20+ years of growing Moie moie,(can also be spelt Moe moe )with never setting fruit,last years cold summer sent them into a berry growing frenzy but this summer so far its back to normal with no berries because its been quite hot. So from last summers berries i grew 12 seedlings in June 2012,these TPS plants are now 9 months old and are still flowering and settling berries,there's no sign yet of them dying down,The interesting part of these TPS plants compared to the tuber grown plant is the size,in the photo the TPS row runs across from left to right in the middle. The Moie moie TPS plants are now coming up 10 months old and still flowering,while there's the tuber grown plants in the back ground which are nearly finished for the growing season,so if it wasn't for winter frost could they just keep on growing and how common is it for TPS grown plants to stay actively growing for this long? 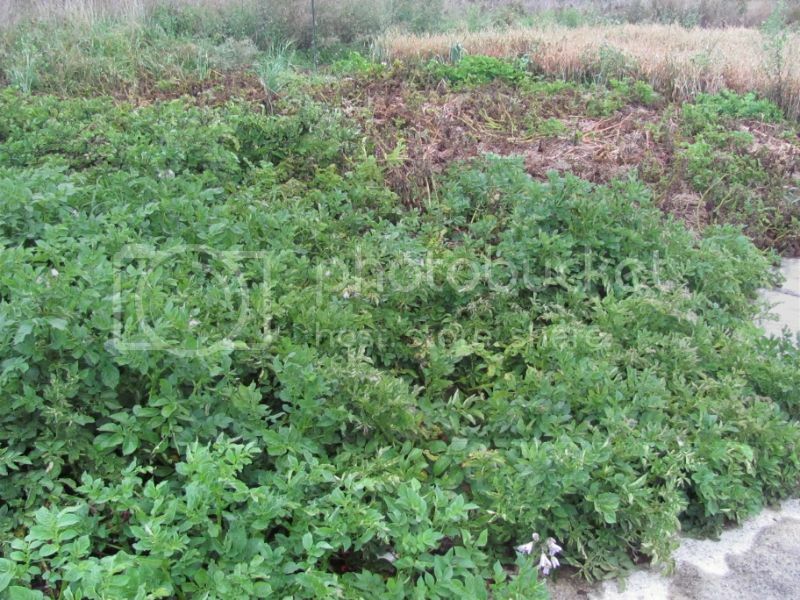 Yes, first year seedling potato plants from TPS often live longer than if from tubers. It makes it difficult to estimate days to maturity. Naturally if one pull berries from healthy vines of rather late varieties/clones...the resulting TPS seedlings may be represented by increasingly later maturities. Since TPS seedlings carry little or no virus unless infected late in the growth cycle....the earlier die back will happen when the tubers replanted carry latent year infections causing rather benign injury but can be seen as much earlier as the years go by....and earliness is enhanced when a potato grows from a tuber anyway....the dynamics of which would take be a while to explain. One may pick up Virus A or Virus S and the plants may appear symptomless but just enough stress is placed on the vine to cause it to die down quicker. 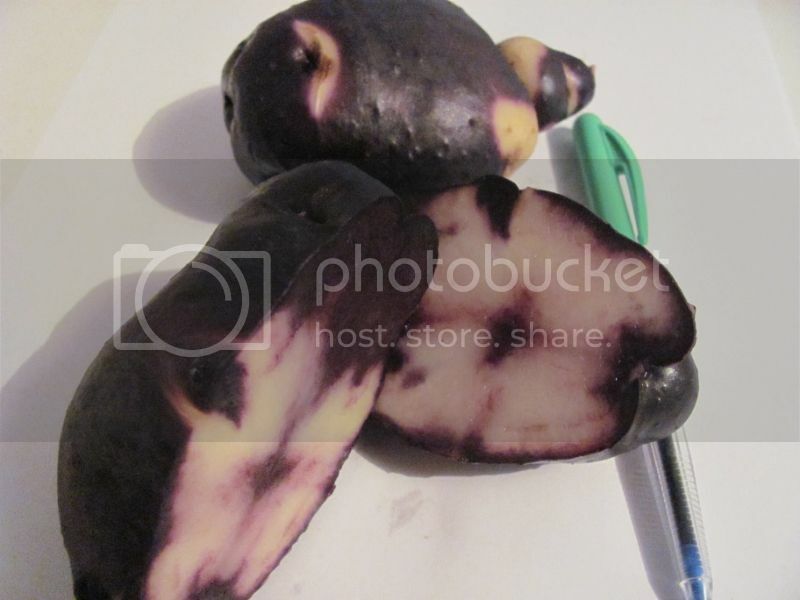 This would explain why my Moie moie tuber grown plants have died back sooner when compared to some different strains of Moie moie given to me from Cesarz,his ones still are rather green but not as much as the TPS plants though. What really amazes me is that one row of TPS have spread laterals out 1.5m each side,i never had plants even half the size from the TPS of yours Tom. Wow ah! Richard those Moie-Moie TPS plants look great. Have any gifted you with TPS berries again? I also had my TPS grow until the frost killed them and by the way the last plants to die in my garden were some of the Mystery TPS plus Fripapa, Muru and Lumper. They are long and store so well....even the red Mystery just barely pip the eyes after a nice 5 months of storage in the basement. Muru even had shown signs of wanting to wake up. yes Wendy the TPS grown plants have grown berries,i'm bothering with then till next season when all i'll have growing are moie moie's. Today i dug up the row of TPS,only two plants did any good,the rest had tubers to small to worry about. 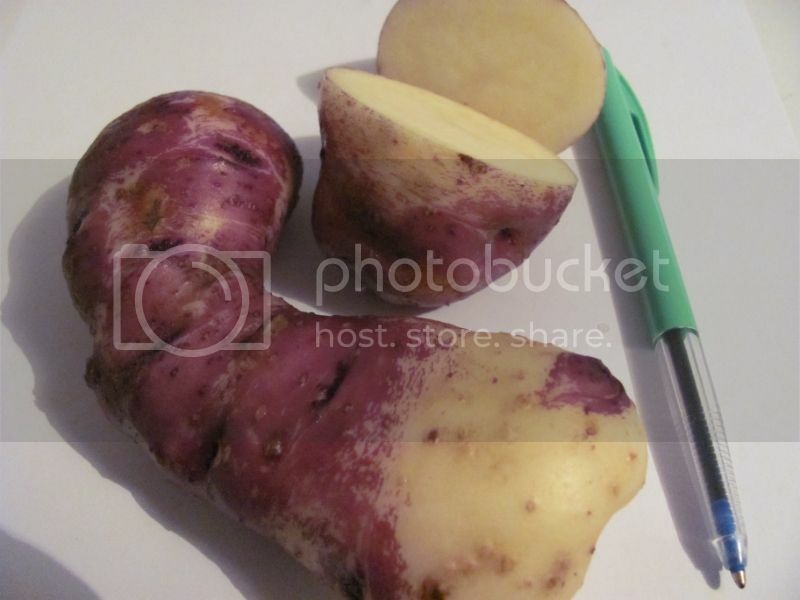 Those 2 look very good, that second potato is interesting color inside and out. Taste wise how they do? The size are nice enough for a 1st year tuber. Interesting that now they are giving you TPS berries the seedlings from Moie-Moie TPS because since Moie-Moie did not give berries for so many years I wonder what made this fertility change. 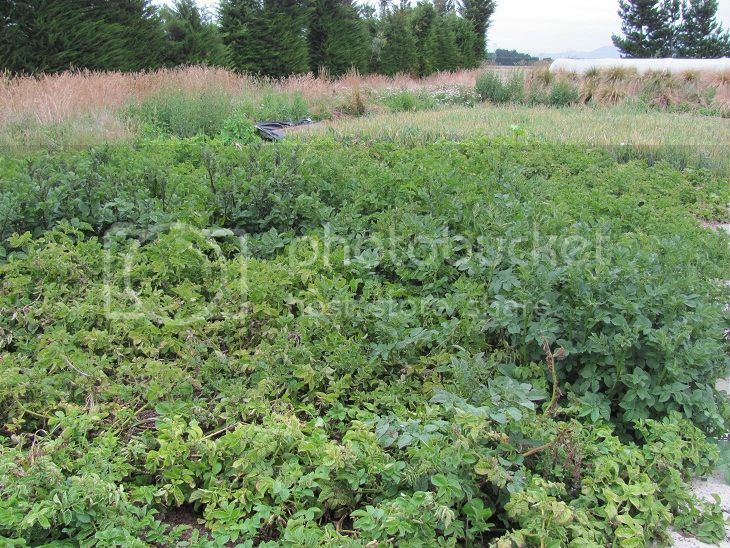 I'll keep an eye on my Maori spud patch this year looking for berries since they'll be a 2nd year clones plus those I saved from your slips. It was the cold summer we had 2011-12 that made the moie moie set fruit i'm sure,summers like that are rare so thats why it hadn't happened before,the summer of 2012-13 on the other hand has been one of the hottest for 30 + years so the original clone plus Cesarz's never had berries. The foliage from the darker TPS plant was so heavy i struggled to pick it up,it would have had to have weighted over 40kgs. Taste was good,but Moie moie are better tasting as a new potato i think. Last edited by Medbury Gardens; April 9, 2013 at 02:48 PM. Please send me #2 if you don't want it. Send me a PM? Hi Wendy, good to see you are still working with Moie moie, how many tubers did you get from it. My experience is the same as Wendy's. The stolons are relatively short and they seem to be pretty much the same length as the other varieties I grow.